The Ministry of Tourism and Entertainment is spearheading a number of planned infrastructural improvements for the resort town of Ocho Rios, as part of efforts by the Government to transform the area and boost tourism business. The initiative is being driven by the Ministry of Tourism and Entertainment, and is being undertaken in partnership with the Ministry of Transport, Works and Housing, the Urban Development Corporation (UDC), the Port Authority of Jamaica (PAJ), and several other Government Ministries and agencies. The plans for the initiative, which will receive funding from the Tourism Enhancement Fund (TEF), were presented to members of the business community in Ocho Rios by Minister of Tourism and Entertainment the Hon. 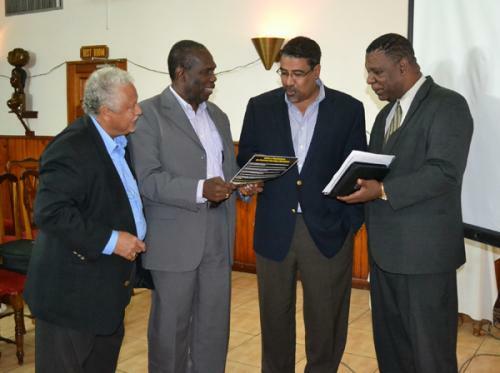 Dr. Wykeham McNeill and other government officials, at a Special Stakeholders Consultation held at the Almond Tree Restaurant in Ocho Rios recently. The meeting was hosted by the Ministry in order to update business and community leaders on plans for improvements to the infrastructure and aesthetics of Ocho Rios, to produce a better visitor experience. There was a general expression of appreciation for the reduction in congestion in the town as a result of the Tourism Product Development Company’s cooperative efforts with the police and officials to enforce order in the service of contract carriage operators. In addition to the infrastructural work, the Ministry is also taking steps to seriously tackle the issue of tourist harassment. Strategic initiatives to address the matter were also discussed. The community was assured that, where it was necessary to apply firm measures to tackle such issues there would be no shying away from such an approach.